https://i0.wp.com/www.bullmarketfrogs.com/wp-content/uploads/2015/04/Brindle_pied_frenchbulldog.jpg?fit=662%2C662 662 662 frogdogz http://www.bullmarketfrogs.com/wp-content/uploads/2015/06/bullmarket-logo.png frogdogz2009-02-28 11:44:022009-02-28 11:44:02Crufts Judges - "be on the look out for unhealthy dogs"
The time for the Jamboree is getting closer and closer, and the management of the resort have requested that ANYONE who has not yet made their reservations do so before March 15th. There are still some rooms available, and if our event is going to take them, another party wants them. I gaurantee that, if you wait until after March 15th, there will not be any space left available. If you are planning on coming out just for the Saturday raffle, BBQ, meet and greet, match and other events, we also need you to give us advance notice. The management wants to estimate the staff they’ll need for parking, and they also need to finalize plans for the BBQ. Or, just bring it along with you! Wow, this is all turning into something approaching work! But if everyone has fun, it will all be worthwhile! London Animal Control – Overly Diligent Much? Do you remember this little guy? 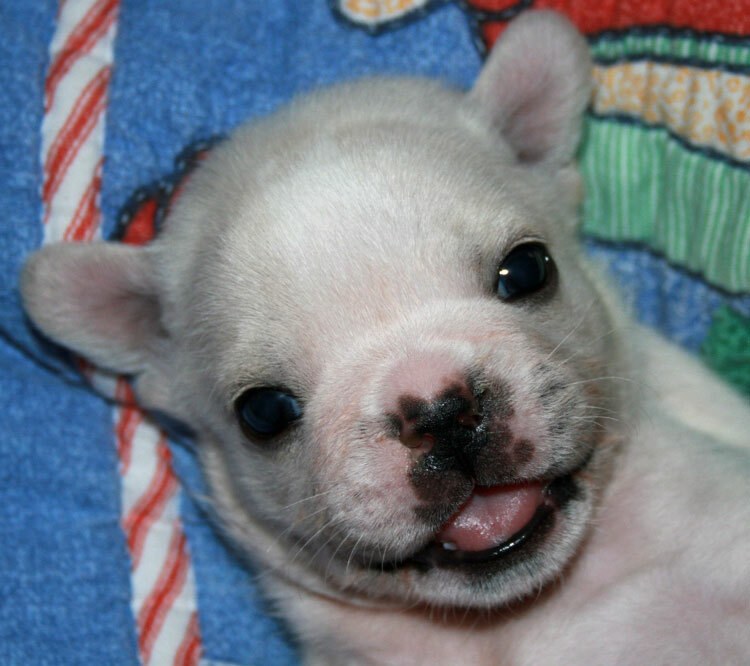 He’s Solo, our singleton French Bulldog puppy, born last fall. He was cute then, and he’s still cute now – a happy little bundle of cream, with a big grin and even bigger ears. Unfortunately, to the city of London, Ontario, Solo is just one more ‘potential Pit Bull’ – and they’re not taking any chances on him rampaging around the town, savaging stuffed animals and viciously attacking sticks. After a few recent posts to the Frenchie mailing lists about the possible risk to French Bulldogs because of Ontario’s so-called ‘Pit Bull’ ban, I received an email from Solo’s mom. Solo lives with his family in London, Ontario, where he shares the house with two kids, his mom and dad and assorted small animals. Solo’s mom, who has asked to remain anonymous for fear that they’ll be targeted by London Animal Control, related to me what had happened when she attempted to purchase a City of London Dog License for Solo. https://i0.wp.com/www.bullmarketfrogs.com/wp-content/uploads/2015/04/Brindle_pied_frenchbulldog.jpg?fit=662%2C662 662 662 frogdogz http://www.bullmarketfrogs.com/wp-content/uploads/2015/06/bullmarket-logo.png frogdogz2009-02-25 16:09:172009-02-25 16:09:17London Animal Control - Overly Diligent Much? Hope took some really fabulous photos at the IKC dog show in Chicago this past weekend. Most ring side photos are blurry messes, but Hope managed to get clear shots of all the competitors. If you live in or near the Dallas Fort Worth area, make plans to attend the FBCDFW Specialty show. Details about the show are below. Say what you will about actor Mickey Rourke, but the man sure loved his dog. The ‘eccentric’ actor, known for his volatile temper, foul mouth, bad plastic surgery and hard drinking ways showed a remarkable soft spot while attending the Academy Awards on Sunday night. Instead of an expensive necklace, Rourke wore a custom made necklace with a picture of his recently departed Chihuahua, Loki. Photos and details after the cut.